I was able to be apart of the Book Club while serving at USHMM. This group was arranged by a fellow intern and was open to any interested interns, volunteers, or staff members. We selected a book once a month and then planned a meeting in order to discuss the book. Occasionally we were able to meet the authors of these works, as some of them were sponsored for book signings at USHMM throughout the summer. This short work included two stories of Holocaust survivors. The first section was dedicated to the experiences of a Polish Catholic woman who was just a young girl at the start of Hitler’s reign. 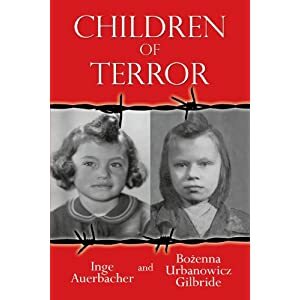 The second section is devoted to the story of a German Jewish woman who also experienced Nazi persecution and the terrors of the Holocaust as a young girl. Both women, born months apart, became friends while sharing their stories in the United States. They decided to collaborate in order to produce this work, Children of Terror. It is excellently written and equally tragic, as both authors vividly recollect their memories and make painful observations from the childhood from which they were robbed. I highly recommend it.